For the first time in memory, the posts overseeing the two largest Eastern churches in communion with Rome are simultaneously vacant. Two weeks after Cardinal Lubomyr Husar retired as head of the Ukrainian Greek-Catholic church after years of delicate health, this morning -- as expected for some time -- B16 accepted the resignation of the Maronite patriarch, 91 year-old Cardinal Nasrallah Pierre Sfeir (right), who stood down due to age. Like the Pope, Eastern patriarchs are elected for life, but may resign if age, health or other circumstances inhibit their function in office. The Maronite Catholic church counts at least 3.5 million members worldwide, some 40 percent of them in the branch's home base of Lebanon. In the US, the church's 80,000 members are served by two eparchies based in New York and Los Angeles. This year, the world's Maronites are marking the 1,600th anniversary of the death of their founding patriarch, St Maron; a statue of the Lebanese hermit was unveiled earlier this week in a niche outside St Peter's Basilica, with the patriarch and Lebanon's President Michel Sleiman. Both Sfeir and Sleiman were received by B16 in private audiences over the subsequent days. Elected to the patriarchate in 1986, Sfeir was elevated to the college of cardinals eight years later. 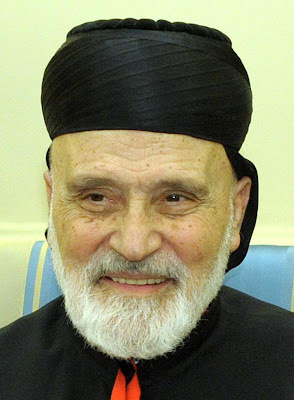 While the Maronite chief was the only sitting Eastern patriarch to be made a cardinal-elector by John Paul II, Sfeir became ineligible to vote in a conclave well before the late pontiff's death. 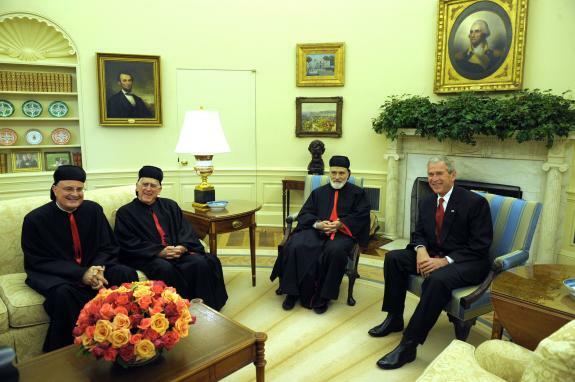 The Roman prominence was arguably due to two factors: the global size of the Maronites -- second only to the 5 million-member UGCC among the Eastern churches -- and, especially, their key role in Lebanese life as the divided country's largest Christian group. Reflecting the latter, Sfeir's quarter-century at the helm has seen the patriarch establish himself as an influential voice in Lebanon's political conversation. In one recent public intervention, the cardinal warned that Syria and Iran were "meddling" in the country's affairs, pledging that "we will try our best to solve the problem." The patriarch's petition to leave office rumored for months, the acceptance of Sfeir's resignation indicates an agreement on a point of contention said to be of great concern to the Holy See: that replacements for six Maronite bishops who've retired over the last year would be in place before a Synod to elect the church's next head. While the face-off's resolution remains unknown, the Maronite church's particular law stipulates that the global fold's roughly 40 bishops are to gather at the patriarchal curia in Bkirki (north of Beirut) no more than one month after the church's top post falls open. On a related note, it was announced last week that the eparchs of the Ukrainian Synod will convoke at the church's former seat of Lviv on 21 March to elect Husar's successor as the UGCC's major-archbishop.